Cincinnati Symphony Orchestra; Paavo Järvi. rec. Music Hall, Cincinnati, Ohio, 23–24 November 2008 (Holst); 22–23 January 2006 (Britten). This is an interesting coupling of works by two of the great figures in English music of the 20th Century. 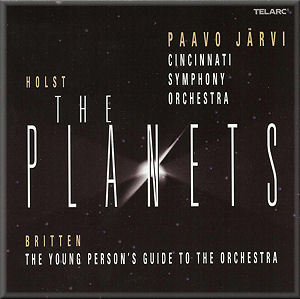 Holst composed The Planets at about the time Britten was born, so these two works form a nice contrast of two generations of composers. The Planets must be one of the most difficult pieces to record successfully. The music ranges in mood from violence in Mars to tranquillity in Venus and ends in the ethereal, other-worldly impressionism of Neptune. Having said that, it must be one of the most recorded pieces of 20th century music and its popularity has not dimmed over the years/ The result is that there is stiff competition from the many recordings available. Holst takes as his inspiration the astrological associations of each of the seven planets which had been discovered at the time. The opening movement, Mars, the Bringer of War, is a violent depiction of war. For all its mechanical feel, it was composed before the mechanised warfare of the First World War. Järvi takes this at a steady pace (it is marked Allegro), but comparing it to Mark Elder and the Halle on Hyperion, it does not have the same menace. Elder takes it at a slightly slower pace to get his effect. Going back to Sir Malcolm Sargent’s 1958 recording with the BBC Symphony Orchestra on Classics for Pleasure; paradoxically, he takes it slightly faster than Järvi, and this time it sounds like an inexorable march, which is equally valid. So is there a ‘right’ tempo for this? Well, I think it comes down to personal preference, but the tempo; and the fact that there is not as great a contrast between the soft and loud dynamics on the current recording; causes it to sound perfunctory. The dynamic range is from pp to ffff – quite a difference which is managed better on the other disks mentioned. In complete contrast the next movement is Venus, the Bringer of Peace. The Cincinnati players give a ravishing account. The individual solos from oboe, clarinet, violin and cello are a delight and sound relaxed. This heightens the contrast with the preceding Mars. Next we have Mercury, the Winged Messenger which, to match the character, should be light and fleet of foot. It is with Järvi, but is compromised again by insufficient dynamic contrast. Elder, on the other hand has a firm grip and although the timings for this movement are similar (3:56 for Järvi, 4:05 for Elder) Elder has the edge with transparent textures. Sargent gets his band to play as if possessed, rattling this off in 3:31 – too rushed. The central movement is Jupiter, the Bringer of Jollity. It’s all in the title – there should be a great sense of joie de vivre about the piece. Järvi is the slowest of the conductors mentioned above, and it shows. The fast sections do not have the carefree exuberance they should – just listen to the very opening where the strings start off ‘chattering’ wildly to each other, followed later by the woodwind. The slow middle section lacks the Elgarian nobilmente of the others. I don’t think it is because the other two are British conductors, because it is there on another recording by a non-Brit – Charles Dutoit with his Montreal forces. Next, in complete contrast, is Saturn, the Bringer of Old Age. This music should convey a sense of world-weariness, the tread of time reaching its end, but also the struggle to hold onto life. This is the most satisfying of the movements on this recording – my only caveat is the bell which should sound clangorous, strident with its off-beat fff outbursts. It hardly registers at all. The ending is one of the most beautiful, and tranquil I have heard. This is rudely interrupted by the next movement, Uranus, the Magician. The players have great fun with its high-jinks, revelling in the swagger and the mischievous nature of this particular magician. The final movement is Neptune, the Mystic. This should be impressionistic with the orchestra conjuring up a soundscape into which snatches of melody can be discerned. The whole is to be played pp throughout. The tempo is on the slow side making it seem to drag when it should have a feeling of forward momentum - it is marked Andante in the score. The ladies’ chorus is nicely distanced, and the fade at the end well managed. Britten’s Young Person’s Guide to the Orchestra was composed for an educational film The Instruments of the Orchestra in 1946 and Britten designed it so it would work with, or without the narration. On this current recording it is without, and so strictly should be called by its other title – Variations and Fugue on a Theme of Purcell. Järvi and his Cincinnati players set off with the opening at a stately tempo which to my ear is just a bit too steady. In the woodwind variations the speeds are too slow to convey the joy with which this music is imbued. It should be fun both to play and to listen to, but I find things a bit too serious. Britten’s own recording from 1967, although with less good sound, conveys the delight that should be there. Things get better with the brass and percussion sections, but by then the rot has set in. In the final fugue the Purcell theme, which makes its reappearance in the brass, does not have the ‘presence’ required to make its full effect. Well played as these are, these versions are not in the top echelon. If you didn’t have either of these pieces in your collection, then this recording would not disappoint; however, there are many better ones available, and not just the ones I have used for comparison. In a very competitive field - especially for the Holst - this issue does not rank high. Also, I would have preferred the Holst to come second on the disk so that the Britten did not launch in after the fade out of The Planets. One ‘black mark’ – neither the CD nor the booklet mentions the name of the ladies’ chorus.